In a past life I was an FE teacher. Each day, I had to capture the attention of mildly interested teenagers and get them to engage. And boy did I discover a lot about tuning people in to learning! That’s because I had a passion for it. So how does this relate to your selling situation? Lesson 1 – Believe wholeheartedly in your product. As a micro biz owner I’m quite sure you’re passionate about your products. But your target audience may not be. So how do you get around this? One way is to embrace your passion. You see, if you truly believe in your product, you naturally talk about it with authenticity. You don’t worry about trying to convince people and instead your sales pitch (if you want to call it that) becomes effortlessly more compelling and real. I call this “selling with heart“. Here’s a practical example of what I’m talking about. I’ve just returned from a crazy three days at this year’s Education Show. 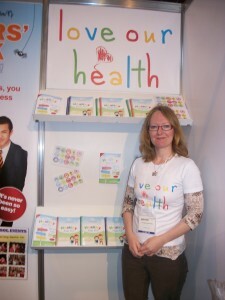 I wrote the Love Our Health’s Healthy Kids Kit and was busy raising awareness of the Kit to visiting teachers (check out the picture!) The Exhibition was great. In addition to a cheek kiss from Peter Andre (that’s another story!) I met a huge number of enthusiastic, committed teachers on the hunt for new ideas and resources. For sure I had a captive audience but to be honest, talking about the Kit wasn’t difficult. It’s not that I’m this great saleswoman, instead I’m passionate about the Kit and the potential good it will do. I have two young children and want to help them avoid preventable lifestyle diseases in adulthood. The Healthy Kids Kit could provide an answer. It’s a unique classroom resource for Key Stage 2 children that gets the healthy message across in a fun, interactive way (you can find out more when you click here). So by letting teachers know the product exists, I’m indirectly helping children grow into healthy adults. For me this is a totally worthwhile project and as a result my conviction and passion helped me say the right things to the right people at the right time. And as a result, the Kit got a really good reception. Lesson 2 – Build rapport. “People like people who are like themselves”. Think about it. If you want to sell with heart, you’ve got to tailor your communication to suit the style, tastes and interest of your customers. The great Claude Hopkins described advertising as “salesmanship in print”. Captures the essence of what you would say to a customer face-to-face. Appeals directly to your target customer – and then reads as if it was written specifically for them. Avoids faceless, generic, one-size-fits-all baloney! Captures the emotion of why your product is a good solution for that particular customer. Of course rapport building is easier face-to-face. For one you can read and interpret body language and respond accordingly. We do this instinctively – it’s just the way humans interact. It takes practice to nail it in your copywriting too. Lesson 3 – Let the customer lead. It can be tempting to corner potential customers out of desperation to make a sale. However, in my opinion, this hard sell approach rarely works. I’ll tell you why. Agreed you might make a sale, but long-term, that customer is likely to feel resentful and annoyed they were forced into a decision. For sure there are times when a customer is happy to make a spontaneous on the spot buying decision. However, more often than not, we take time to warm to a company or a product. We want to get to know them. Going back to the Healthy Kids Kit, I don’t want to pressure people. That tactic won’t work. Instead I want teachers to embrace the Kit and deliver it enthusiastically because that way the children will benefit more. A much more palatable alternative is the content marketing approach. Content marketing is ideal for building rapport and nurturing a relationship with interested parties who in the longer-term may become customers. So instead of looking to make a sale, make it your aim to build your list. Then talk to your list on a regular basis with useful, relevant content that adds real value to your customers. Try this and in time, and only when the time is right, you could be on their short-list when they’re ready to buy. I’ve got more ideas about using content marketing to build a tribe of enthusiastic customers here. In the meantime, have a think about your approach to selling. How could you embrace your passion and enthusiasm and translate it into some authentic sales copy? How do you sell with heart? Talk to me and leave your comment below! Sounds advice Georgina. I love the phrase “a tribe of enthusiastic customers”. I’ve never thought of my customers and potential customers as a tribe before! It’s cool isn’t it! It’s so important to build a following for your business. Some people will buy from you while others will help spread your message. That’s the beauty of a content marketing approach. By creating and distributing high quality, relevant information, you give your customers a compelling reason to stay in touch and look forward to hearing from you. Wow Georgina! I love this post! Thanks Veronica and that’s a great quote. It really captures the essence of copywriting or selling with heart, and as you already know, it’s a great place to conduct business from. Very nice article, Georgina. You have the understanding that separates good people from great salespeople: that, as passionate as you are about your product, and as important as the product is, ultimately, it’s not about the product but about how it fits the needs of the customer. And, to the degree they feel comfortable with you and the context you’ve created for the selling process, that’s the degree to which the odds are increased that they will choose to do business with you. Terrific! Thanks for your comment Bob and what a great summary. I found your book The Go-Giver crystallises a lot of these ideas. It’s an invaluable read. Looks like great advise, I think I do this but have never articulated it before. I love the term and the way you express things so clearly.